taught by students who have experienced and achieved the success in becoming Black Belt. Welcome to PMAFA's Parent\Student Workshop 101. 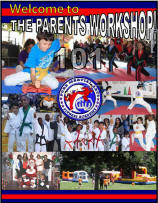 This is where you will get the information needed for you or your child's success in studying Tang Soo Do at this Academy. It is very important to note that there is just as much psychology involved as there is kicking, blocking, and punching so do NOT take this meeting lightly as it will open many doors and your mind to how our program will help you overall. It is designed for new parents but also to update\remind tenured parents in which many times they have forgotten about the tools and how to use them. What to do when the going gets tough! Most useful is our website. If you are not computer literate or have issues accessing the website, you are missing valuable training information and videos for your child and yourself. Please be on time so you do not disrupt the presention or other parent's time. Thank you. Yes, I will attend the workshop. No, I am unable to attend at this time.